There are many work in the Rice making. There are weeding and work like the water management in the rice field besides the work recorded here, too. Moreover, the work made daily is abundant, and the rice making is troublesome one. It is rice field that I was managing until 2005. This rice field stopped cultivating because superannuation of the bridge in the river where it went to this rice field, and wild boar's damage was extensive time-consuming to management now. I was completely making "Koshihikari" of the no agricultural chemicals no commercial fertilizer cultivation in this rice field. The seed falls naturally rather than planting the lotus to use the lotus as a fertilizer every year and it grows. Because the processing of the lotus is difficult now, the lotus is not grown. I will replant in the rice field in about one month after the seed paddy is sown to the rice nursery. Water is put in the rice field beforehand, and it flattens in the rice field. 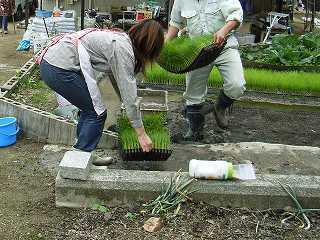 It is easy to prepare the seedling because this is a rice nursery of the jar type. The seedling of the rice plant of the jar type is pulled from the rice nursery and peeled off. The soil of the bottom of the seedling is washed in water and it drops. 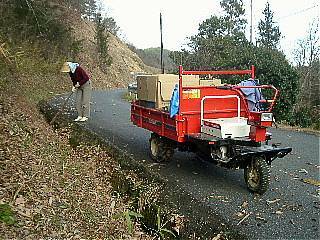 Next, a small amount of insecticide of the weevil ([inemizuzoumushi]) is scattered. It puts to the transportation car and it carries to the rice field. 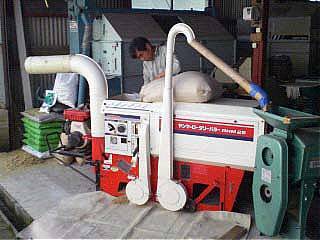 I plant it in the rice field in the harvest Article in the planting rice machine for the pot type. The way is fairly different from an old planting rice. It is planting rice to which it takes days how many in old times. However, it can be ended in a day now. 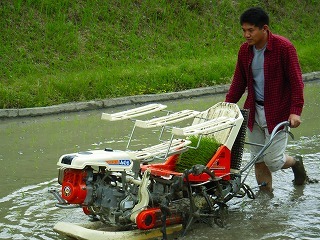 This planting rice machine bought it in cooperation with the vicinity. The root of the seedling rice might be occasionally too long and it not go well. At that time, the root is cut. 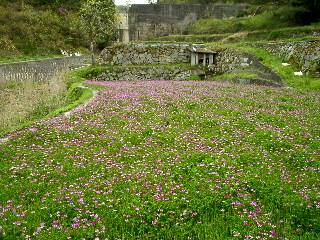 The rice plant flower blooms when about the end of July - August comes. It is a small, unremarkable, white flower. 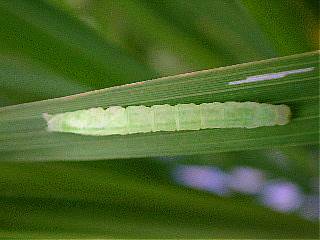 It is a rice plant caterpillar of the harmful insect of the rice plant ([ineaomushi]). Because agricultural chemicals are not used at all, the leaf is lost in an awful place. However, this damage seems not to be more awful than externals. 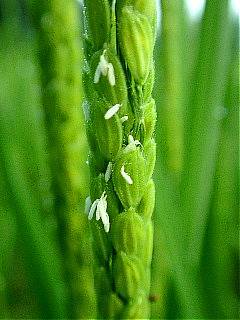 It is an arachno that exists in rice field. If agricultural chemicals are not done at all for years how many, various animals are generated. This arachno is comparatively large one. There seem to be usually a lot of small arachnos. 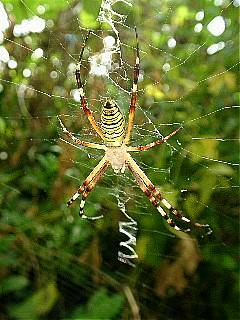 Because the arachno eats the harmful insect of the rice plant, it is a useful useful insect. 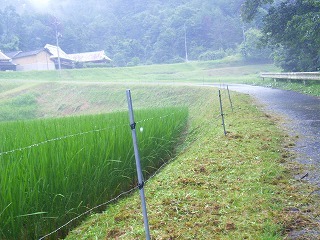 The electrified fence where the rice plant was defended from the wild boar was jointly set up in three of the vicinity. First of all, the vinyl pipe for water-service works is driven at about 4m intervals after it weeds deliberately. 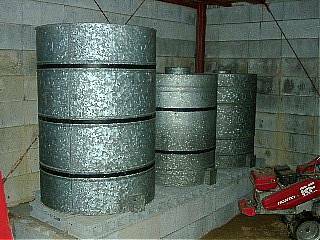 It covers with the vinyl pipe after the reinforced concrete of about 10mm in the diameter is driven in the corner to increase strength. Next, the wire of about 1mm in the diameter is installed with the vinyl tape. Because I had had a stainless line at hand, it was used. Height that strung electrical wires was adjusted to about 25cm and 60cm. The blitz device for the electrified fence of making by oneself put on my home and fed power with AC adaptor. Rice was harvested with the combine. There is a good machine that says the combine by total putting out the family compared with old times, and it has ended at once. I multiplied by the gobioid cutting it by the hand and after it had dried, was threshing childhood by the thresher or the harvester. It was work that it takes how many days. It is dry after this with the grain dryer. Hulling the rice is work that removes rice husk from a dry paddy and makes to the brown rice. Huller with the engine is used. A left photograph is a huller of the RHM25 rotary selection type 2.5-inch roll of Yanmar. 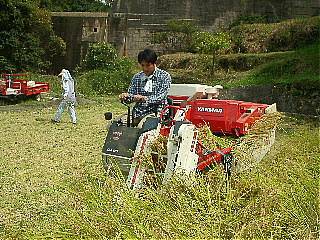 It is the one that a right photograph selects and removes small rice of rice grader. The selection doesn't go well and the paddy mixes by all means though the huller of the rotary selection was heard that the operation is easy. It is not possible do not go well when the horizontal of the airframe has gone mad even a little and to know. I will try and err variously when doing this time. The far movement type seems to be better for the selection. The stone has mixed with the rice harvested recently though there was no stone in rice up to now for years how many. 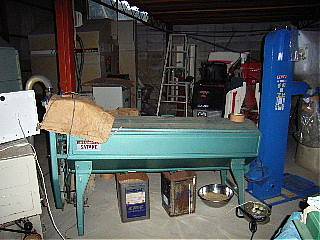 Also because it was a trust problem because it sold rice, it made it to the purchase of the stone pulling out machine. A heavy thing moves to the above when rice is dropped on the inclined net, and the entire net is shaken and it seems to be able to select it. It is a principle that looks like that well though I use winnowing in childhood, and grain was selected. It is a can that stores the brown rice. The number of farmers who use such a can seems to decrease recently, and to use the storehouse like the refrigerator with the bag of mostly 30kg. I added the device to earlier methods and made it to the storehouse in a half underground. This part is about 2m in the underground. 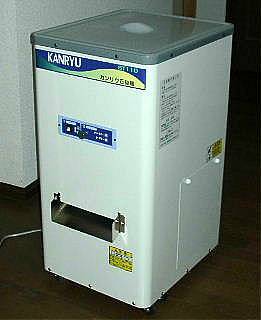 It doesn't use electricity and it would be better to be able to store it at about 12-22℃. It is done that carbide (The molecular formula CaC2) is put in the paper bag to prevent moisture and the husk warehouse insect ([kokuzoumushi]) from springing and it hangs it on the inside. Fallen leaves are collected and it makes it to the fertilizer of rice field. Fallen leaves in the roadside are collected and it makes it to the fertilizer of rice field. It carried to this transportation car by heaps how many by the wife and two people. There was no time and it rounded it up in a suitable point though it was how much still if looking for, too. Because the carrier inclines at the transportation car with the engine like the dump truck, earth and sand also is carried and it is convenient.